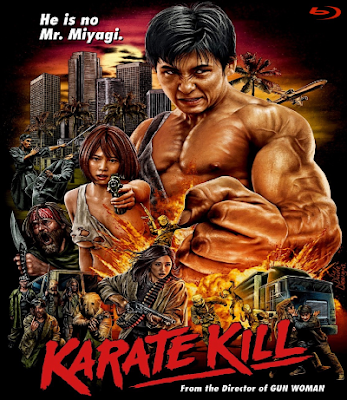 Kurando Mitsutake's KARATE KILL is a must see for any lover of over the top martial arts films or for anyone who needs an injection of WTF action into their lives. It is one of the most out there films I've seen in a long time. The plot has Kenji leaving Japan to rescue his sister. Arriving in America she finds that she has gotten in with some bad people. Eventually he end up battling the cult of Captain Messiah in the middle of Texas and killing pretty much everyone. For get the plot and just go with the escalating waves of violence as the entire state of Texas goes after Kenji and dies horribly. This is just awesome over the top confrontation after confrontation. Time after time I thought this could't get wilder but it does. Ears are ripped off, fists are punched through throats and blood flows as Kenji fights to rescue his sister. I have no words other than if you like action and don't mind it just being out there, you must see this. Its out on DVD Bluray and VOD and worth whatever you pay to see it.